Tomorrow is the big day! Santa Claus will hop in his sleigh and have his reindeers take him around the world delivering goodies for all the good boys and girls out there. And he will do it all while live Tweeting. If you want to ask the big man himself if you are on his naughty or nice list, just send him a tweet. Santa Claus tweets from two main accounts. 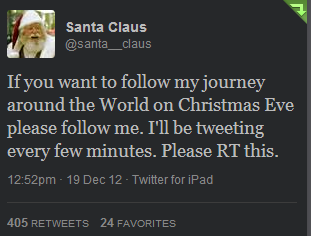 @Santa_Claus has more than 13,000 tweets and boasts 100,000 followers. @Santa_Claus likes to tweet about the countdown before Christmas, the weather that may affect his journey and his busy elves. @Santa_Claus also lives online at Lapland Letterbox, a website where you can request a letter from the jolly fellow. Just like Santa has many helpers fill in for him at various shopping malls, Santa also has a few helpers online. 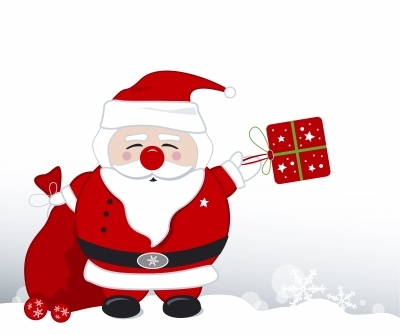 @NoradSanta provides up-to-the-minute information on Santa’s journey. @NoradSanta has more than 3,000 tweets and 94,000 followers and tweets about the games you can play on NoradSanta.org and the many people helping Santa’s Norad Operation Centre get geared up for the big night. Of course, behind every great man, there is an even greater woman. Mrs. Claus is busy and active online too. Every day in November and December Mrs. Claus shares news from the North Pole with the help of her good friends at Canada Post. This entry was posted in Social media and tagged communications, digital communications, kristine simpson, marketing, mrs. claus, public relations, santa, santa claus, social-media, Twitter by Kristine D'Arbelles. Bookmark the permalink. ← Previous Previous post: Young PR Pros: Episode #38 – What should young pros do over the holidays?